Braised Collard Greens With Chicken Sausage Over Polenta. (Photo by Tom McCorkle for The Washington Post). Collards have a reputation for being an overcooked Southern vegetable. They get an energizing facelift in this recipe when paired with sausage, tomatoes, polenta and cheese. This recipe is my riff on one from Virginia Willis’ new book, “Secrets of the Southern Table: A Food Lover’s Tour of the Global South” (Houghton Mifflin Harcourt), in which she explores Southern favorites through the lens of the incredible cultural diversity of the region. That global influence explains how tomatoes and a rind of Parmesan cheese made their way into her braised collard greens. Her recipe could be dubbed a literal melting pot, except rather than cooking her greens long enough to “melt” them, in a more modern style she braises them until just tender. We prepared them together when she was a guest on my Facebook Live feed, and while we prepared the dish together we bandied about many possible variations on her mouthwatering recipe. One that stuck in my head was the idea of turning it into a main course by adding Italian sausage and serving it over polenta. Because polenta and grits are both cornmeal porridges, it seemed a fun and tasty way to take the Italian-Southern food connection a bit further. So I went for it, and this recipe is the result: A comforting, richly savory stew with a heap of healthful greens and enough lean poultry sausage to ratchet up its satiety factor as a main dish. Served over polenta, it makes a fulfilling meal that brings together a world of wonderful flavors. Make ahead: The braised vegetables and sausage mixture can be refrigerated for up to 4 days. From nutritionist and cookbook author Ellie Krieger, based on a recipe from “Secrets of the Southern Table: A Food Lover’s Tour of the Global South,” by Virginia Willis (Houghton Mifflin Harcourt, 2018). 1. Heat 1 tablespoon of the oil in a large nonstick skillet over medium-high heat. Add the sausage in pinches; cook for about 4 minutes, stirring occasionally and breaking it up with a spoon into smaller pieces, until it is well browned. 3. Add the broth, Parm rind and crushed red pepper flakes. Increase the heat to high and bring just to a boil, then reduce the heat to medium-low and cook, uncovered, for 30 minutes, stirring occasionally. 4. Add the sausage and the collard greens; increase the heat once more to high just long enough to return the mixture to a boil, then reduce the heat to medium-low; cook for 15 to 20 minutes, stirring occasionally until the greens are just tender. Taste, and season with salt and black pepper, as needed. Remove from the heat; cover to keep warm until the polenta is ready, or refrigerate for up to 4 days. 5. Cook the polenta according to the package directions, to a soft and porridge-like consistency. 6. 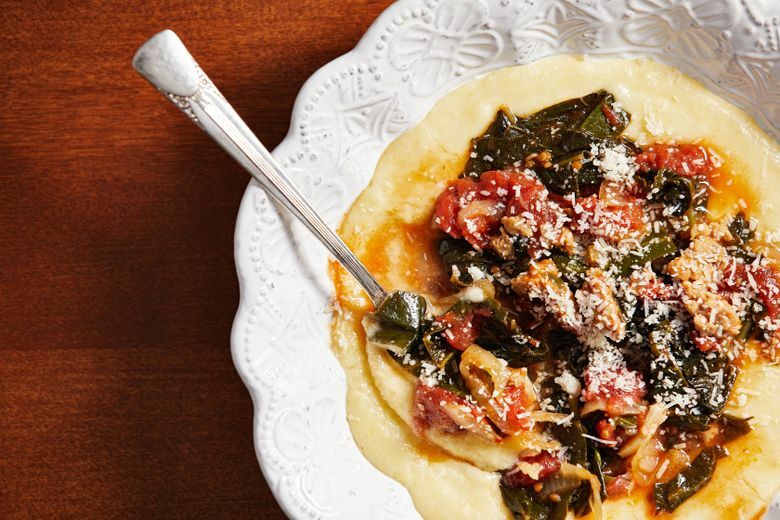 Divide the polenta among serving bowls, top with the braised collards mixture and sprinkle with the cheese. Serve hot. Nutrition per serving: 290 calories, 14 g protein, 35 g carbohydrates, 10 g fat, 3 g saturated fat, 50 mg cholesterol, 490 mg sodium, 5 g dietary fiber, 5 g sugar.